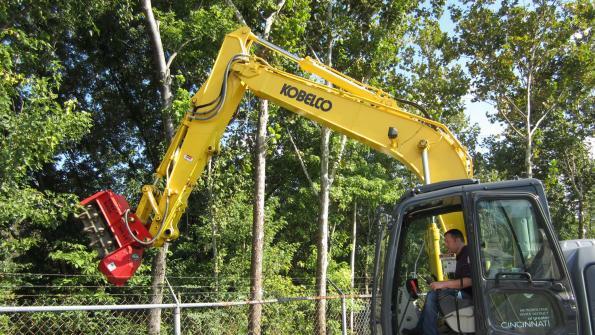 The Metropolitan Sewer District of Greater Cincinnati is grinding down up to 20 years of overgrown bush with a new equipment combo. The district has attached a Fecon CEM36 hydraulic Bull Hog mulcher head to an excavator to get the job done. For equipment operators at the Metropolitan Sewer District of Greater Cincinnati (MSDGC), spring yard work means attaching a Fecon CEM36 hydraulic Bull Hog mulcher head to an excavator and grinding down up to 20 years of overgrown bush that may have built up over 20 years. By using the Fecon mulcher, supervisor Ryan Welsh only has to send a one-man crew out once a year to maintain the sizeable real estate owned by MSDGC, which frees up his team to perform other work such as mowing grass and maintaining landscaping. Fecon is based in Lebanon, Ohio. Over the course of a year, fast-growing honeysuckle bushes and other types of brush encroach upon the thousands of yards of fence line that protect the city of Cincinnati’s pump stations and treatment plants. Having up to 10 feet of clear space between the fence line and the surrounding woods ensures security and the integrity of the fences. Welsh explains that in addition to increased sight lines with open space between the woods and the fence, keeping trees far away from the fence makes repairs easy. “If trees and brush grow up, you risk the chance they’re going to fall and then you have to keep doing repairs. You can’t do fence repairs if there’s all this brush growing up against it,” he said. Welsh used to send out a 5-man crew with chainsaws and hand tools, or hire a tree trimming company. Sending labor crews out was less safe and an inefficient use of manpower that often required the team to spend several days per year manually clearing brush. Hiring a tree trimming company freed up his crew, but also cost up to $2,000 a day. With hundreds of stations across the city that needed maintenance, hiring out contractors simply wasn’t cost effective. At a Fecon “Demo Day” in 2011, Welsh investigated the possibility of attaching the CEM36 mulcher head onto an excavator, which the district already owned. A year later, he was sending out one-man teams to the far corners of the county to use the new Fecon equipment. 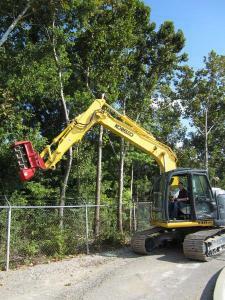 MSDGC owns a Kobelco 140SR excavator, and no modifications were necessary to attach the mulcher head. Thanks to the equipment, the district avoids the paperwork and expense of hiring tree-trimming contractors. In addition, four members of Welsh’s maintenance crew are freed up to mow lawns, work on landscaping, and perform other facilities maintenance jobs. “There’s plenty of other pressing work they can be doing,” says Welsh. In the photo at left, a Fecon CEM36 hydraulic Bull Hog mulcher clears vegetation around a fence. The 5-man chainsaw crew he used to send out to clear brush could clear about 50 feet per hour, and often had to revisit the same site more than once because material would grow back. With the excavator/mulcher head combo, one operator can trim the brush from the other side of the fence at a rate of 100-200 feet per hour, easily doubling the productivity with one-fifth the manpower. MSDGC operators transport the excavator/mulcher tandem around to various job sites throughout the city using a city vehicle with a trailer. All employees trained to operate the excavator can easily adapt to using the mulcher attachment, so training was not an issue, says Welsh. This allows flexibility in scheduling jobs, as any one of his operator crew can be sent out to cut back growth from fence lines. After operating the unit for over a year, MSDGC has yet to find anything that the Fecon Bull Hog can’t chop up. Most of the brush is pliable honeysuckle, but often, young trees sprout up near the fence lines. Anything up to 6 inches is easy grinding, but even oak trees up to 15 inches across can be mulched if the crew takes its time. Once ground up, the thick mulch left behind is cosmetically appealing, so MSDGC is able to just leave it lay to decompose. MSDGC has only had the Fecon mulcher head for a year, but Welsh predicts they’ll use it for up to four weeks every year to cut back brush. Cincinnati MSD originally purchased the equipment targeting a five-year payback, and Welsh believes that the payback goal will be achieved, now that he has had a chance to see the mulching equipment perform. In this video, the Fecon CEM36 performs forestry mulching. The CEM36 is a heavy duty fixed tooth mulching attachment that is built to fit a range of mid-sized excavators from 7 to 15 metric tons.